River Ave. Blues » OOTP Guest Series: What if the Yankees sign Bryce Harper and Manny Machado? OOTP Guest Series: What if the Yankees sign Bryce Harper and Manny Machado? The hot stove is running cold right now, so this week we’re running a series of guest posts from Sam Tydings, Steven’s brother. Sam used Out of the Park Baseball to simulate some past “what if” Yankees scenarios. We’ve already looked at the Greg Maddux non-signing, the Albert Belle non-signing, the Vlad Guerrero non-signing, and the Cliff Lee non-trade. Now it’s time to look forward with Bryce Harper and Manny Machado. You can follow Sam on Twitter at @simmonsclass. We’ve spent the last week looking at pivotal moments from the Yankees recent past, so for the final installment of this series, let’s take a look at the team’s immediate future. With Spring Training right around the corner, it seems like the Yankees roster is set, aside from adding maybe a swingman or a few non-roster invites. Though we have heard all offseason not to count them out until the ink is on the page, it seems highly unlikely that Manny Machado or Bryce Harper will be joining the team at Steinbrenner Field in a few weeks. Better writers than I have spent the entire offseason making a case for the Yankees to sign one, the other, or both, so to wrap things up things up this week, let’s take a look at the most tantalizing option and give Harper and Machado a (fake) home in the Bronx. One of the reasons offered as to why the Yankees should pass on signing either big name free agent is that it would inhibit the team’s ability to lock up their homegrown talent down the road. If you are one of the people citing that as a reason to avoid both stars, the results of this sim are for you. I signed Machado to a 7-year, $186 million contract (a steal) and Harper to a 9-year, $326 million deal (probably more in line with what he ends up getting). The signings paid immediate dividends, as the Yankees won 105 games to cruise to the AL East title and eventually the pennant. 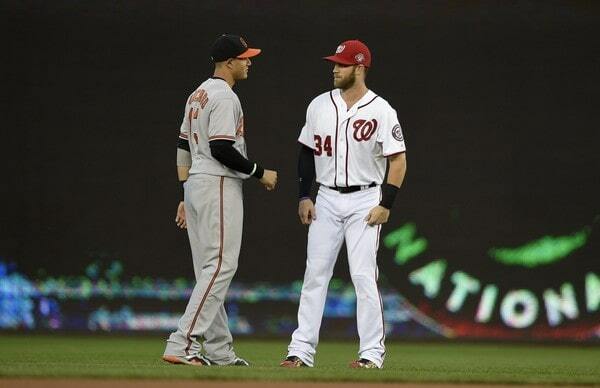 Harper hit 46 homers en route to the MVP, while Machado hit 32 and brought home the Gold Glove at 3B. The team brought home title number 28 in 2020 and everything seemed good in fake Yankeeland. Unfortunately, the big money handed out to Machado and Harper reared its ugly head as the team chose to let Masahiro Tanaka and James Paxton walk, leading to rapidly diminishing returns from a once strong rotation. The team did not make it back to the World Series for the duration of either of their contracts. Both players finished their careers with over 550 home runs, were elected to the Hall of Fame in their first years of eligibility (Harper 98%, Machado 94.2%), and both even went in as Yankees. However, the idea of signing both of these players to long term contracts at their young ages is to ensure a dynasty comparable to the late 90’s teams, or if you want to be incredibly optimistic, the dynasties from the 40’s. The Yankees as currently constructed are probably good enough to win one of the next few World Series without adding either Harper or Machado, so winning just one in a decade with both of them staying healthy would be an unparalleled disappointment. There was an assumption from the moment that he debuted on the cover of Sports Illustrated that Bryce Harper would don the pinstripes at his first opportunity, and Machado has been linked to the team since at least last year’s winter meetings, if not earlier. There are probably Yankees fans out there who are already photoshopping Vlad Jr. into a Yankee hat and trying to figure out where he would hit in the 2025 lineup. For a variety of reasons, these dreams rarely come to pass. The Sabathia coups are much less common than seeing Cliff Lee, Max Scherzer, and David Price end up on another team’s roster. On its face, the Yankees offseason so far has been a success. They’ve added a very good pitcher to their already strong rotation, added to the best bullpen in baseball, and increased their depth in the infield. Considering how much of the rest of the league seems to not have an interest in winning, it has been an extremely productive winter for Brian Cashman and company. The Yankees can afford to add Harper and Machado to shore up two of the only relative weaknesses on their roster and they should, simply for the fact that it would keep two elite players from joining other teams. Do they need either one to be successful? I don’t think so. If Out of the Park Baseball is to be believed, even bringing both into the fold would not guarantee an instant dynasty. But 26-year old talents rarely hit the open market in any year, much less two in the same winter, so why not take advantage of the cold stove? If any organization in the league is built to withstand the inevitable circus that would come with such a power move, it is the Yankees. Most baseball fans will lose their minds over the Yankees spending big and cornering the market again. But not only has every other team had plenty of time to lock in either player, I have a very large sim file which shows that even in a Yankees fan’s fantasy offseason scenario, it might work out in a way that will make the Yankee haters happiest of all when the final story is written.